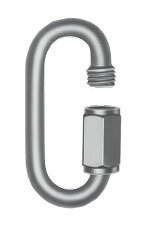 Applications: As temporary repair link, use one size larger than proof coil chain (grade 30) with which it is to be used. Also used to couple light attachments. Description: Low carbon steel, self colored or zinc plated finish. Not to be used for load securement (tie-down). Applications: Used to attach various accessories to chain. Low working load limits only. Description: Mild steel, bright, zinc plated. Packaging: 50 pieces in a carton. Applications: A chain attachment for general use. Description: Low carbon steel. Finishes are bright or zinc plated. 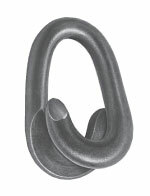 Applications: Used as a repair link, connecting link or attaching device. Description: Zinc plated, not heat treated. Use only with chain of equal or lower working load limit. Applications: A temporary repair link also used to couple light attachments. 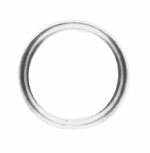 Description: A mild steel, available with bright, hot galvanized or zinc plated finishes.